These beauties arrived today. I paid £10.46 across two ebay auctions. I picked up a USA version last weekend as well. Now I just need to pluck up the courage to have a go. Might be my Sunday shave when I have a bit more time. Nice score, they are lovely shavers. Now try some modern handles to see what a bit of extra weight can do. I use a 2BA thread to join the head onto a M5 handle. I hadn't considered that. Does it make a big difference? I have 4 or 5 of these 1912s and in my experience they're much better with a heavier handle. I'd suggest 80mm and between 50g and 70g. Like a Bulldog 80mm. I put a copper handle on one of mine. 80mm and 67g. I also use mine with a heavier handle. That's it then. I'm in the market for a heavier handle. Is there no end to the rabbit hole I've gone down. Make sure you get the threaded connector. Three nice 1912s. Lovely shavers. I would start with the original handles first to get the feel of them. I'd choose the middle one for your 1st shave. Just gave one of the 1912's a go. Closest shave I have ever had. A couple of nicks though (only two weeks of DE shaving so I'm not surprised). Beautiful razors, and great shavers! Put the top cap on your face, or close to it while shaving. I always prefer the original handles on mine, but some fellas just can't help modifying everything they own, they would put a mustache on the Mona Lisa! No, I'm afraid there is no end to the rabbit hole you have found yourself in. I will see you down there at some point! P.
I am waiting for mine to arrive, loft find apparently £10 on flea bay. Plus a 1950's unused brush. Gem Personna. Worked well for me. 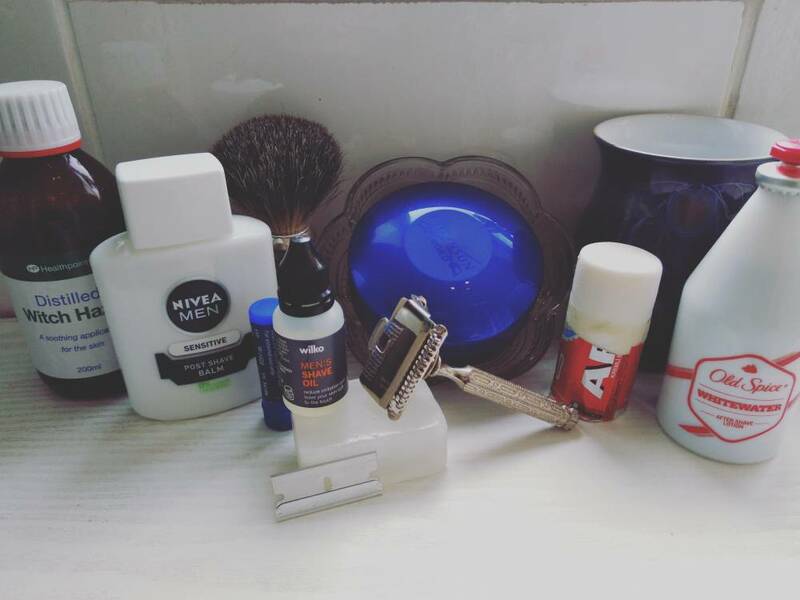 The anticipation of the first SE shave was immense and it didn't disappoint. Looks really nice and the brush is rare bonus from what I've seen. I think the anticipation of a new razor arriving is good fun too. Oh man what a month I have had. Kid in sweetie shop. This one I cannot wait to see. I just love the simplicity of tools that work. 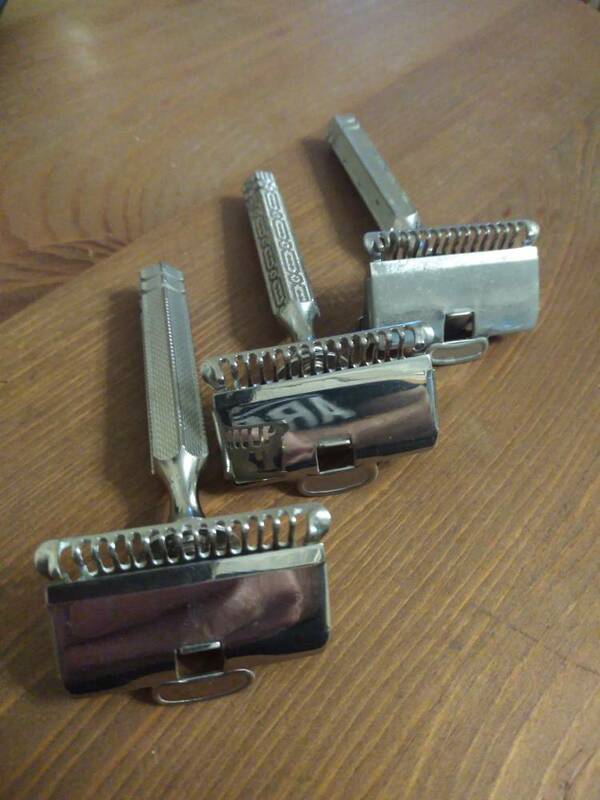 Daft thing is it was been given some Gillette plus 2 carts by the mother in law (about 40 in unopened packs) got me started, could not throw them out on principal, they belonged to a favourite Uncle of mine. So a search began on how I could best use them. Got a Buffalo horn handle Dr Dittar from Germany. Snowballed a bit. Loving every minute of it. Of all the Gem-type vintage models, my personal favourite is the Ever Ready "Natural Angle", which even comes with a leaflet telling you how to use it. AKA GEM "Featherweight", great little razor, but I like the G-bar better.